Hello! Today I made a card for a challenge at Mod Squad where red and brown were the theme colors. I usually begin with a base card but this time I will begin with my focal point. When I think of red, I think of beautiful red poppies which I love. So, the first thing I did was to die cut a panel in ivory using Marianne Creatables Small Ovals by Petra die. While still in the die, I sponged GKD Kraft ink around the oval. In the next step, I cut out poppy flowers using Memory Box Prim Poppy die. In order to have red flowers and green stems, I cut the poppies twice - once in red and again in green - and then paper pieced them. I also added some shading to the poppy flowers, although you may not be able to see it in the photo. I wanted to add some foliage to the stems so I used another poppy die from Memory Box Perky Poppy and used the foliage from that die. I then popped the poppies on my focal panel with dimensionals. So that the poppies wouldn't stand alone, I stamped a butterfly in Memento Espresso Truffle ink from GKD Celebrate the Season stamp set and colored it with Copic markers. I stamped the butterfly a second time on another piece of card stock, colored it, cut it out and then popped it over the stamped butterfly. I then prepared my base card in kraft card stock. I added a layer of ivory and then another layer of red which I had embossed with a lattice embossing folder. My finished focal panel was then popped on to my card and my project was complete. Olga this is so pretty. I love the additional foliage and the shading on that wonderful oval die cut. I love that poppy die and use it often. This is really lovely Olga. I love the poppy dies you used. Too precious! Exquisite - I hope you win a bunch of challenges with this creation!!!! This card is truly lovely, Olga. I'm quite smitten with your lovely art designs, and I thank you from the bottom of my heart for sharing your lovely art in our challenge. Stunning! gorgeous card, thanks for joining us at Fan-Tastic Tuesday this week. Very elegant. Thanks for sharing with us at Aud Sentiments this fortnight. Sincere thanks to all for your kind and lovely comments. Absolutely gorgeous. You are so talented! 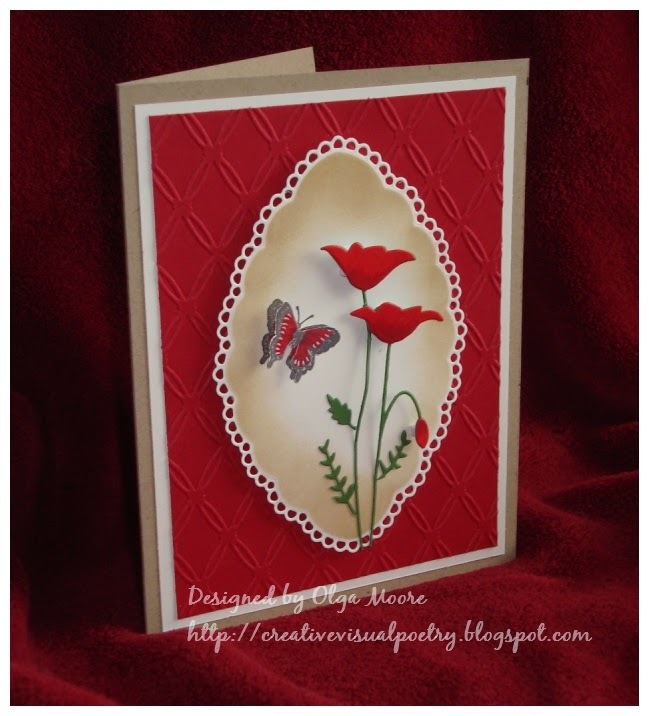 Beautiful card, poppies are one of my favourite flowers! Thanks for joining the Crafty Girls Challenge, hope to see you again soon. Oh my is this gorgeous! Loving the red flowers and paper! Well done! Have a Blessed day! Love the BOLD colors on this and those flowers are AMAZING! Thank you for joining us this week at Word Art Wednesday! Very simple, elegant and pretty. wowza! This is stunning! Love that oval shape with the edges like lace! Thanks for playing along in our Mod Squad challenge this week! What a stunner - that red is so eye catching.